Rose is a human with powers, as is her father, and both are monsters. It’s a secret from everyone. Her father works for the Department, who keeps peace and deals out justice. He has taught her not only how to use her powers, but to use her head as well. He started teaching her from when she was very little. Her abilities are strong and she has been unofficially helping the Department for years. Rose thinks she know what her future holds, but not everything goes as planned and Rose faces difficult, impossible choices that will change her. Meanwhile, her father has to deal with an old enemy threatening to rekindle the war. Rose has to deal with her Father’s other enemy that will expose their secret if she doesn’t help him. Rose and her father have a strong parent-child relationship. Rose also has great friends, who stick by her despite the fact she is a little self-obsessed. It was also great to see that even though Rose’s best friend was a boy, their relationship was platonic. 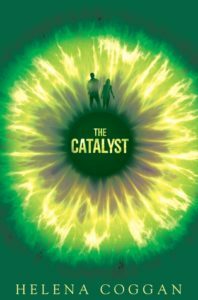 The Catalyst was action-filled with lots of twists and turns to keep you on the edge of your seat. I can’t wait to find out what will happen to Rose, her father, and the Department in the next book.